SAMWUMED has announced that it will be extending its partnership with Medscheme, a leading medical aid health administration and managed care organisation. 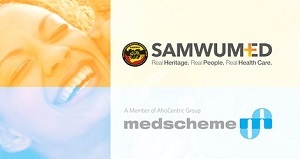 SAMWUMED, a prominent medical scheme for local government and associated services employees, has announced that it will be extending its partnership with Medscheme, one of the leading medical aid health administration and managed care organisations in South Africa. According to Principal Officer of SAMWUMED, Neil Nair, the Scheme engaged with Medscheme as its Hospital Benefit Manager in 2015. “Through this partnership the Scheme has already yielded positive results in the areas of risk mitigation and in skills transfer. Given the positive impact of this partnership SAMWUMED’s Board has agreed to extend its partnership with Medscheme to include its Medicine Management and HIV/AIDS disease management programmes,” said Nair. Nair added that the extended partnership with Medscheme will support the Scheme’s philosophy of integrating patient care such that healthcare interventions are more holistically managed – thereby enabling a more cost effective and a more proactive healthcare experience by the patient. He also said that integration at this level is also more enabling to allow for improved preventative care initiatives. Commenting on the HIV/AIDS programme, Nair said that the Scheme is keen to ensure both best practice and keeping its members in the best possible treatment regime. “To this end, we have appointed Aid-for Aids – a subsidiary of AfroCentric Health, Medscheme’s holding company, to manage the SAMWUMED HIV/AIDS programme. We are confident that the interventions will ensure that our afflicted members will be provided with a proactive and compassionate intervention,” said Nair. “Medscheme is proud to be the appointed managed care partner to SAMWUMED and we fully embrace, with SAMWUMED, the challenge of both reducing the cost of care, as well as improving the quality of such care,” said CEO of Medscheme, Kevin Aron. Aron added that its managed care services are designed to ensure that healthcare delivery is coordinated in the most efficient manner in order to facilitate care that achieves best possible health outcomes and service experience of members with the resources available. “The Medscheme Vision of ‘Building a World of Sustainable Healthcare’ is thus completely aligned to SAMWUMED’s core purpose of improving people’s health and quality of life,” said Aaron. “Medscheme is hoping to develop a true partnership with SAMWUMED where we leverage our collective strengths to radically transform the private healthcare funding industry in containing escalating healthcare costs, ensuring that healthcare outcomes are improved from a clinical quality perspective, and widening the access to care so that ultimately the beneficiaries of SAMWUMED enjoy a better quality of life,” continued Aron. SAMWUMED and Medscheme have both been active for decades in seeking to transform the healthcare industry so that high quality care is made accessible to the population of South Africa in an affordable manner. In addition, both organisations have been active participants on the Board of Healthcare Funders (BHF) – playing a leadership and mentoring role to the industry. With the long history of collaboration and partnering between SAMWUMED and Medscheme, the awarding of the managed care contracts by SAMWUMED to Medscheme further solidifies this relationship. An official signing of the partnership between the two organisations took place on 30th November 2016 at the SAMWUMED Head Office in Athlone, Cape Town.